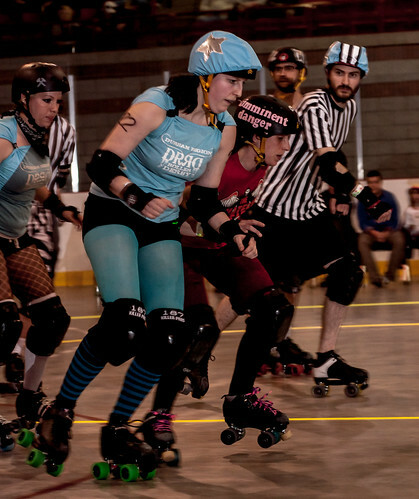 Preamble: The crowds were filling up The Hangar while the D-VAS were hosting their first ever bout against the likes of Bones Brigade and Jewel Kicker as Durham Region Roller Derby took to the track for their inauguration to the competitive track as well. Durham have come a long way, baby. Since then they have gone through the growing pains and acquired a steady place they can call their practice space. 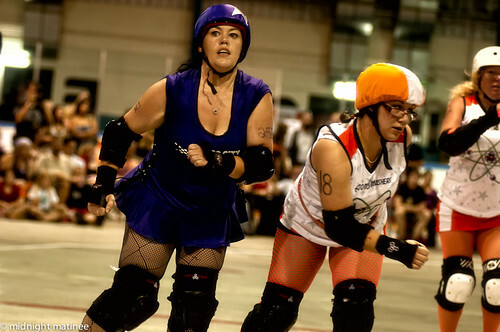 The Derby Gods and Durham Region Roller Derby’s biggest fan must be smiling today. The Gibson’s Cup commemorates the spirit of the league’s friend and ardent supporter, Gibson. The story of Gibson, who the league first met when he was an 11 year old boy, touched the hearts of all of Durham who supported him and is detailed elsewhere more eloquently in their programme. The 19th of August finally came, and DRRD were ready for the first home game in its history at at the Village Arena in Ajax, Ontario. Durham has been a league in evolution: last year they were the Durham Classy Trashy Rollergirls, but that dissipated and transitioned into the new league represented by the current trio of teams. Durham has always been good for hitting the road, with their all-stars combined as the Durham Roller Derby Devils, spreading the good word about themselves, from Fresh and Furious to 2 Fresh 2 Furious down at GTA Rollergirls turf or Peterborough’s Electric City, Ottawa’s Capital City or other Derby domains such as the West End Waywards Rollergettes. True believers in the original spirit of Derby, self-motivated, fighting to get ahead, cultivating their Derby family, newbies and vets alike with great coaching and great fans. And at long last Durham held their first home bout. This is not a story about that game itself – but as you can tell from the photos over at Gibson’s Cup the score was kept close with killer hits from Hitz and company on the Atom Smashers, and returned in kind by Slamureye on Motor City. 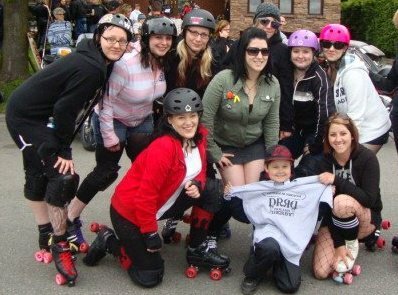 “A lot of us have been skating together since the beginning of our derby lives, and skate together as a team when we compete as the Durham Derby Devils. The abundance of Derby experience and expertise within the league and who came out to support Durham was rather astounding, with the presence of different leagues coaches and referees who came to help run the show smoothly. Durham’s normal coach Blammo was announcer for the night in complement with Mo Daddy and Crankypants Jr. 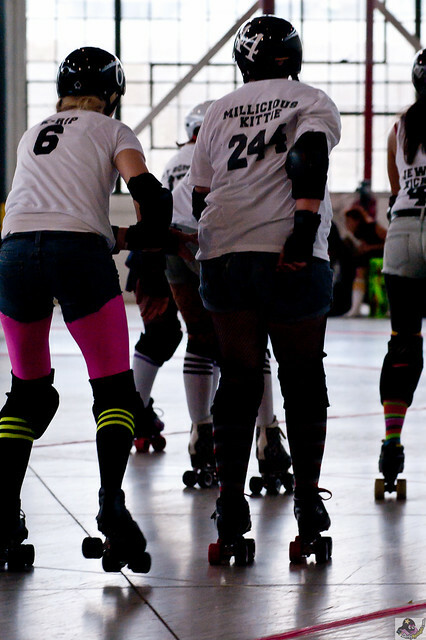 There were a few familiar personas on the track, Hitz Miller and Darth Kater had changed names from before, but Cutsie Bootsie was still around from The Hangar days against the D-VAS. 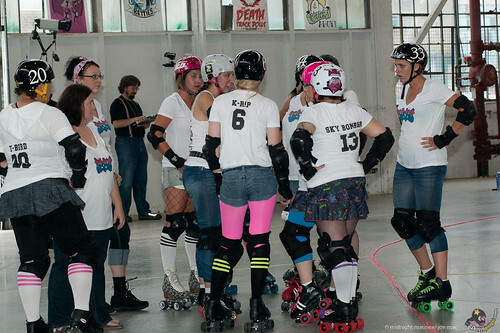 During the game, Coach Lucid Lou on the side of the Motor City Madames only asked two things: “Blockers, skate harder! Jammers, skate faster!” and heaven only knows what coach Mouth of the South said to the Atom Smashers. But words can only go so far – it’s the heart of the players that drives the skates to higher revvs around the track. The worn-out faces on the players and the sweat and blood and bodies on the floor was all the evidence one needed to show they were complying with their coaches. The Atom Smashers jammer rotation starting with 12 Gage and Legzy Maegzy went head to head against the Motor City Madames Cutsie Bootsie, Darth Kater and Blood Muffin in the first half, then the substitutions started coming in as Smashers began to tire or save their legs. 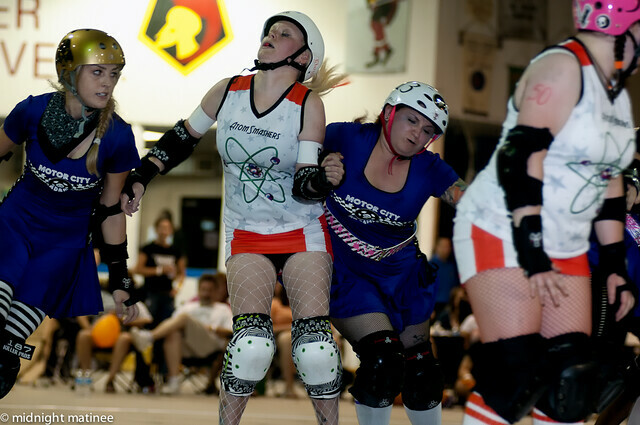 Morpheus’s line from The Matrix came true: “Stop trying to hit me, and hit me!” Any reluctance the Atom Smashers and Motor City Madames had for hitting fellow leaguemates for real in a real game fell in a wayside of hits and blocks that caused players to tumble and collide with the floor. 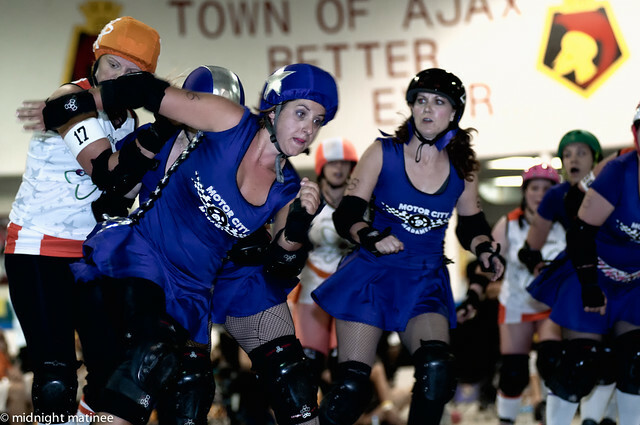 The Motor City Madames raced to the front to create the walls and allow their jammers to slowly pull away and garner the points. What was a see-saw one or two point difference began to expand in the favour of the blue as the second period clock wound down to zero. The anticipation on the Motor Cities Madames bench was palpable. #244 Hitz Miller from the Smashers took to the Naughty Spot penalty bin for the last time.